Liquid laundry detergent bottles unfortunately seem to routinely develop leaks, whether from the easy pour spout or the actual seams on the bottle. This is a guide about storing laundry detergent without the mess. 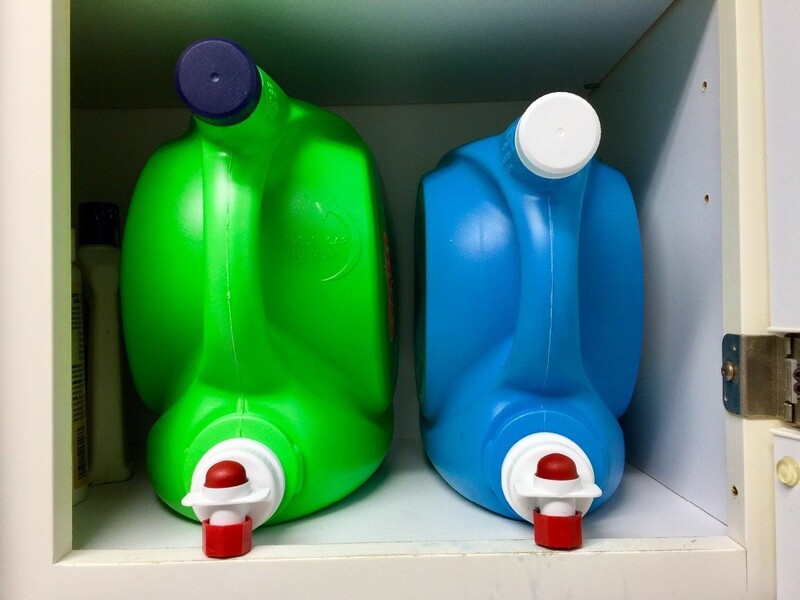 I store my large laundry detergent dispenser and my fabric softener dispenser in a cabinet over my washing machine. I slide the detergent container out of the cabinet and dispense the liquid by letting it drop into the washer by counting to 4. No matter how careful I am, the spout drips inside my cabinet and makes an awful mess. The blue fabric softener is even worse. It stains my white cabinet absolutely nothing will remove that blue stain! So the next best thing is to prevent the drip. 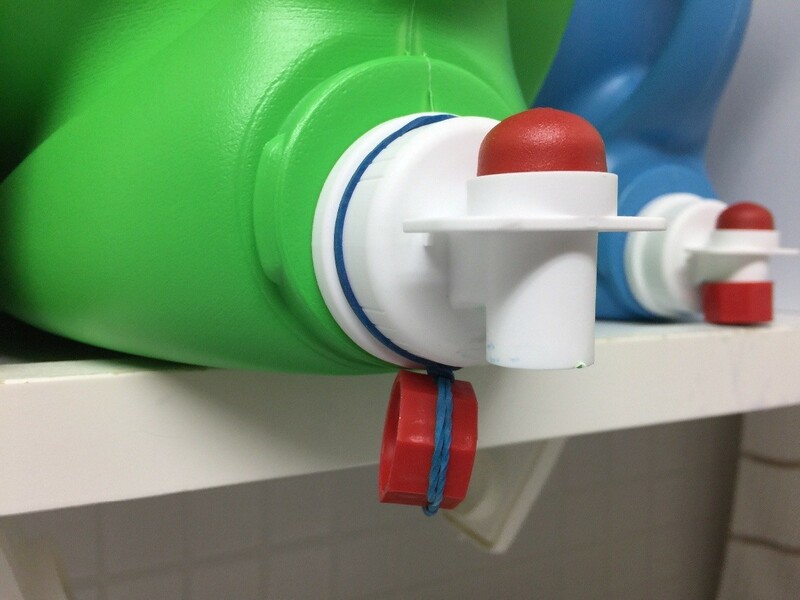 No worries, there is a lid that fits both the detergent and the fabric softener spout. It is the Tabasco hot sauce lid. Save one for each spout. 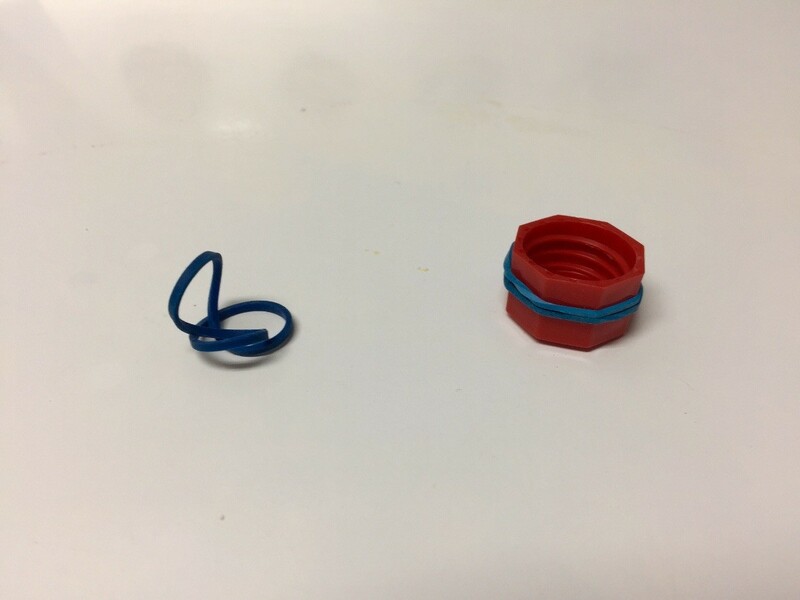 You will need 2 rubber bands to secures each lid. Follow the photos for instruction but basically you wrap one rubber band around the Tabasco lid. 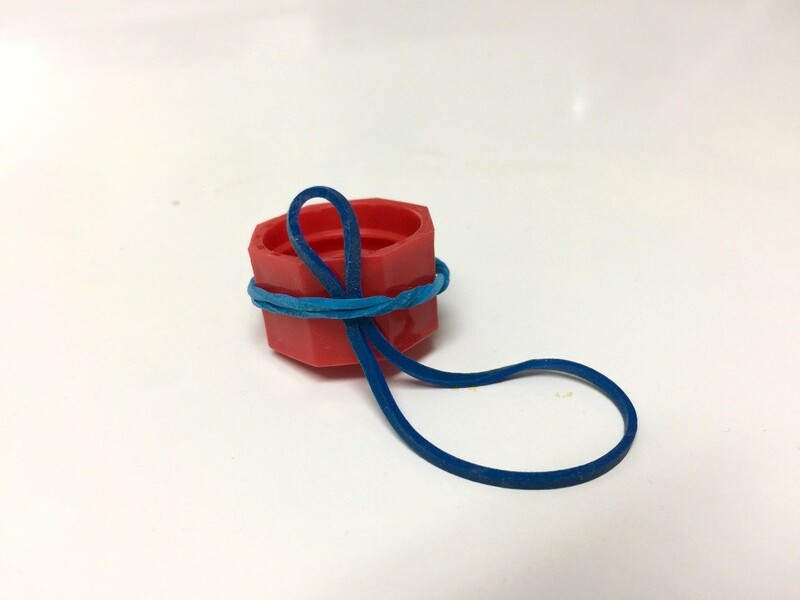 Then you fish the second rubber band under the first and slip knot it. 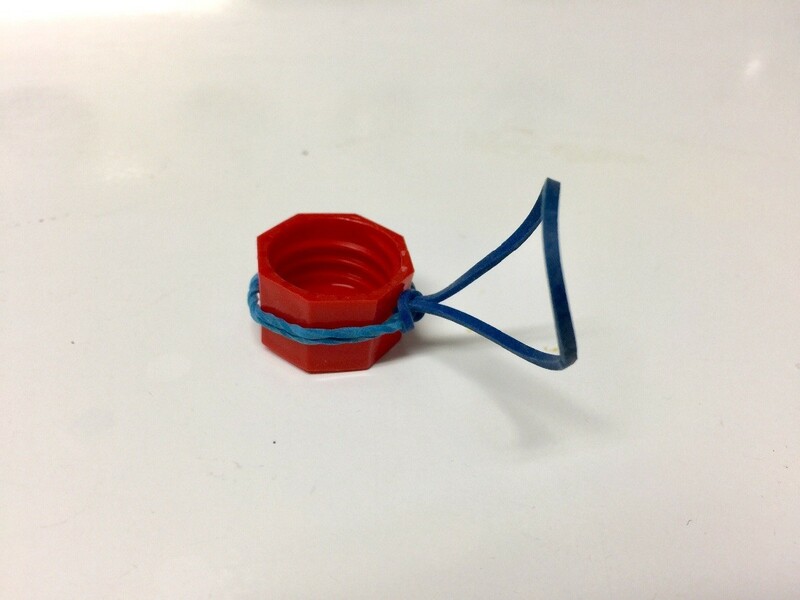 Then you slide the loose rubber band over the spout. It will hang nicely to the side to allow you to dispense the liquid. 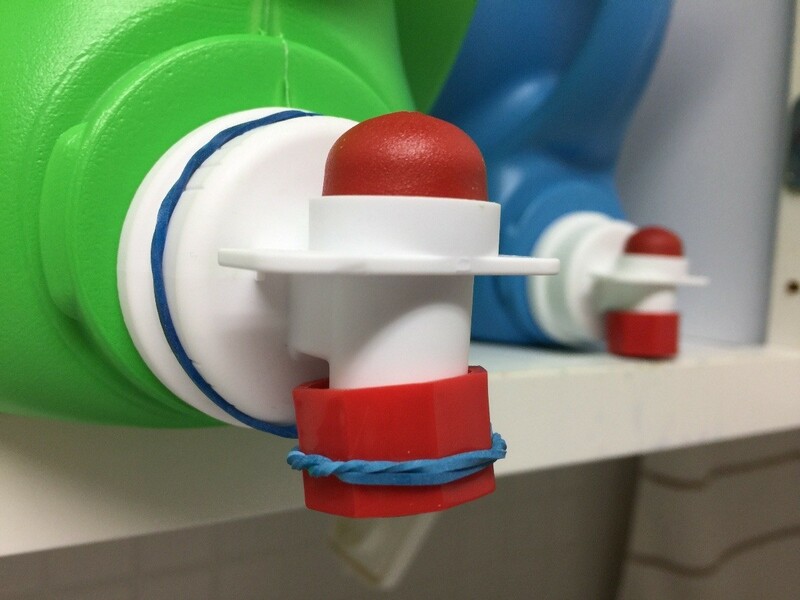 When done, cap the spigot and slide the container back into the cabinet. No more drip. Remember save your lids there can be used for so many things ! Why does the easy pour laundry detergent always leak? I put it on the shelf above the washer and make sure the cap is on securely, but it leaks. I tried standing it on the side and the detergent seeps out creating a real mess in my laundry area and wasting a lot of detergent. 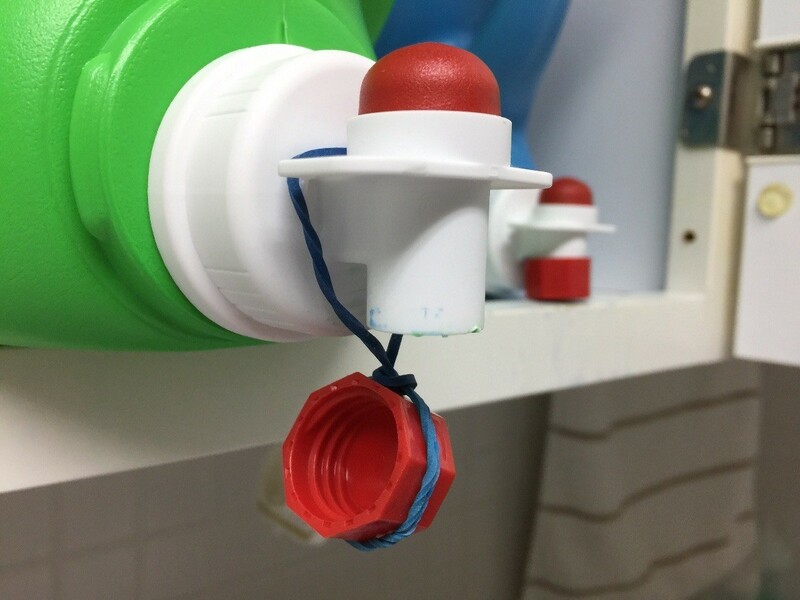 More than likely your detergent bottle is not leaking, it is the cap leaking after you have used it. (After you put it back on, the remaining detergent begins to seep out.) Try pouring the soap into a disposable cup (or another cap you have saved from an earlier bottle) and see if that's not "it". It is an annoying feature of liquid detergent. The same thing happens to me, it isn't the cap leaking it's the actual carton. Here's a thrifty tip I used to fix it: I took a used, empty dryer sheet box, folded the lid back, and slid it under the container. That way the dryer sheet box is under the spout, and the container drips down into the box. Problem solved, no more gummy, sticky messes to clean up. Hope that helps.